Winnie-the-Pooh is an lovable bear character created by author A.A. Milne. Milne wrote several Pooh books and stories. The first book published was Winnie-the-Pooh (1926). The second book, The House at Pooh Corner, was published in 1928. Milne's Pooh bear children's character was also featured in two of Milne's poetry collections: When We Were Very Young (1924) and Now We Are Six (1927). 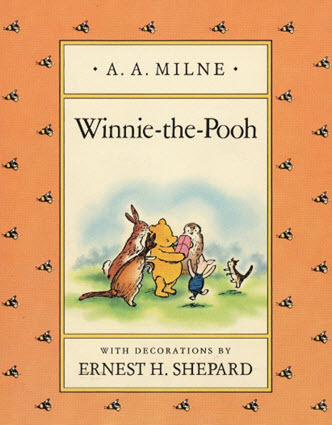 The books featuring Winnie-the-Pooh were illustrated by E.H. Shepard. Winnie-the-Pooh has been adapted into television shows, cartoons, films, plays, video games and more. The Wikipedia entry has a good collection of them. Many of them are Disney productions because Disney took over the rights to the characters in the 1960s. Birthdays: "Nobody can be uncheered with a balloon." Pooh said this to Piglet after Piglet came up with the idea of giving Eeyore a balloon as a birthday present. We love the word uncheered. Eeyore's Weather Forecast: "I shouldn't be surprised if it hailed a good deal tomorrow. Blizzards and what-not. Being fine today doesn't mean anything. It has no sig - what's that word? Well, it has none of that. It's just a small piece of weather." - from The House at Pooh Corner. 11 O'clock Meal: Pooh loved to eat at eleven: "Nearly eleven o'clock," said Pooh happily. "You're just in time for a little smackerel of something." from The House at Pooh Corner. Eeyore on Writing: "This writing business. Pencils and what-not. Over-rated, if you ask me. Silly stuff. Nothing in it." Fitness: "A bear, however hard he tries, grows tubby without exercise." Listening: "If the person you are talking to doesn't appear to be listening, be patient. It may simply be that he has a small piece of fluff in his ear." Blinching: "You only blinched inside and that's the bravest way for a Very Small Animal not to blinch that there is." Pooh to Piglet in The House at Pooh Corner. Jagulars: Pooh on Jagulars in The House at Pooh Corner: "That's what Jagulars always do. They call 'Help! Help!' and then when you look up, they drop on you." Expeditions: "Oh! Piglet," said Pooh excitedly, we're going on an Expotition, all of us, with things to eat. To discover something." Tracking Woozles: "It is either Two Woozles and one, as it might be, Wizzle, or Two, as it might be, Wizzles and one, if so it is, Woozle. Let us continue to follow them." Owl's Weather Forecast: "The atmospheric conditions have been very unfavourable lately." Pooh on Poetry: "They wanted to come in after the pounds, so I let them. It's the best way to write poetry, letting things come." - The House at Pooh Corner. Spelling: Wobbly writing in Winnie-the-Pooh: "Because my spelling is Wobbly. It's good spelling but it Wobbles, and the letters get in the wrong places." On Aging: Piglet tells Pooh, "Promise you won't forget me, ever. Not even when I'm a hundred." - The House at Pooh Corner. Good Morning? : In Winnie-the-Pooh, Eeyore greets Pooh by saying, "Good morning, Pooh Bear. If it is a good morning. Which I doubt." Motivation: A motivational quote from Pooh: "You can’t stay in your corner of the Forest waiting for others to come to you. You have to go to them sometimes." Bravery: Piglet on being brave: "It is hard to be brave," said Piglet, sniffing slightly, "when you're only a Very Small Animal." - from Winnie-the-Pooh. Timelessness: "Wherever they go, and whatever happens to them on the way, in that enchanted place on the top of the forest, a little boy and his Bear will always be playing."